The viral marketing campaign for Da Vinci Code author Dan Brown’s new book will set new promotional ground by teasing his fan base with a series of innovative puzzles, hidden codes and games scattered across the Internet that are bound to intrigue us as much as any of his mystery novels. With a release date of September 15, 2009, the official web site for The Lost Symbol contains links to the official Twitter and Facebook pages, which Random House says will be updated daily with a series of clues. In an email alert, the publisher promises codes, cryptic trivia, puzzles, secret history, biblical references, maps, ambigrams, aphorisms, ciphers, arcane knowledge, and more” between now and the release of the highly anticipated thriller sequel. For fans of the Da Vinci Code (2003) and Angels & Demons (2000), it will be interesting to watch how Brown will intricately drop a series of virtual bread crumbs for us to follow. In essence, we will all become participating sleuths. The twitterati and Facebook users will become micro-detectives as well, tracking down clues that will whet our appetites in anticipation for main meal to be served up this Fall. 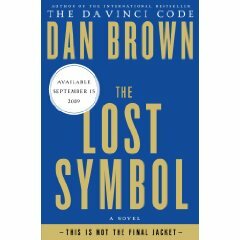 Like Brown's other novels, The Lost Symbol is his third novel featuring the Harvard University symbologist Robert Langdon as its protagonist. With an initial printing of 5 million copies, the book's narrative will take place in Washington, D.C. and focus on Freemasonry. Amazon.com's offering pre-order discounts for those of you who want don't want to risk not being able to purchase a first-run edition. Stop back to this blog in the months to come as the viral evidence and forthcoming clues will be revealed here. Happy hunting for the Lost Symbol!